The Chelsea Harbour Hotel overlooks Chelsea Harbour’s 60 berth Marina and forms part of the Chelsea Harbour development built in 1986-7. The site was of an ex-British Rail Coal Yard and Victorian-era railway coaling dock on the River Thames. The 20-acre site lies between the Thames and Counter's Creek. Chelsea Harbour was the biggest single construction project in the United Kingdom for decades. 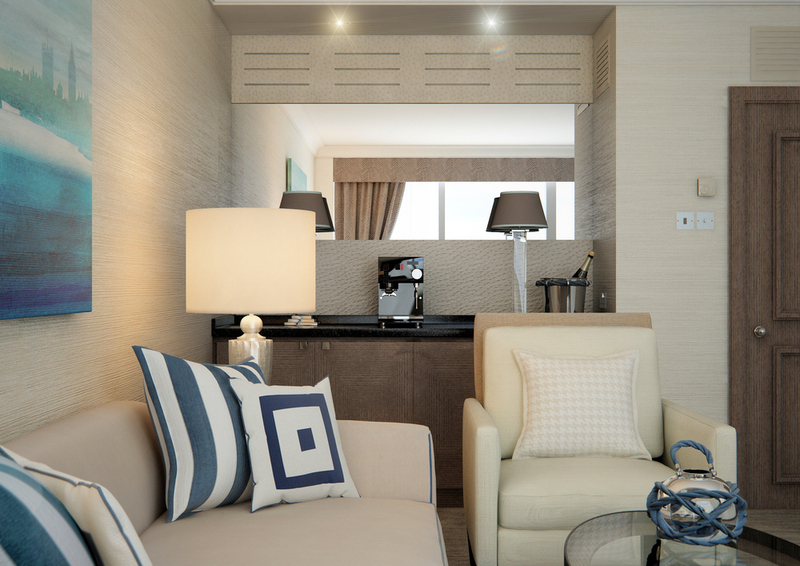 ‘THE SUITES’ proudly plays tribute to the harbour’s location and its nautical tradition, its position being 48 miles from the Thames Estuary and open sea via London’s River Thames. The design concept subtly references the materials and heritage of yacht building combined with a modern industrial chic that incorporates; nautical details, navigational graphics and Morse flag pattern. Material choices are elegant woods, elegant luxurious fabrics leather, chrome, and rope details.